For many years, Streptocarpus ionanthus ssp. velutinus (top) and Str. ionanthus ssp. orbicularis cl. orbicularis var. purpurea were thought to be separate species. Now both are understood to be subspecies of Str. ionanthus. The Taxonomy or scientific classification of African violets has undergone a number of revisions over the years. These changes reflect a change in the process of how plants are described as species. Originally, plants from different collection sites with small variations in appearance were described as belonging to different species. However, as DNA sequence information became available, plants were grouped more by DNA similarities and species boundaries shifted. 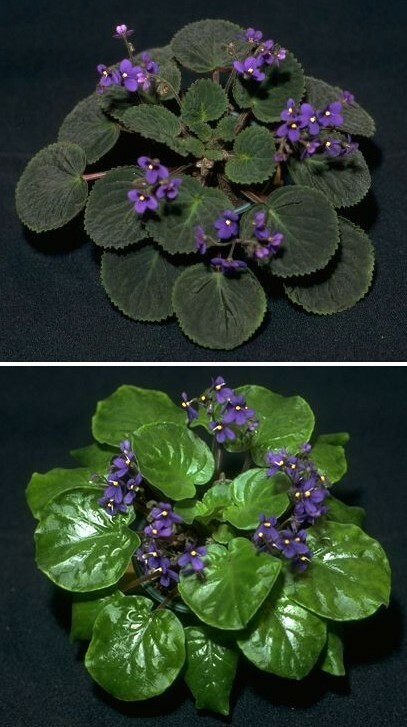 The most recent DNA work has repositioned entire genera, including African violets into a single genus. A consequence of this most recent work is that the plants we’ve long known as Saintpaulia species and hybrids are now properly known as Streptocarpus. Saintpaulia remains a Section within Streptocarpus, and that Section contains all members of what had been known as the genus Saintpaulia, but these species and their hybrids are properly known as Streptocarpus. On the GRW, we will abbreviate the genus name as Str. for all former Saintpaulia species, but use Saintpaulia when referencing hybrids. The following pages briefly describe the history of the many taxonomic changes for African violets.